Mohandas Karamchand Gandhi (2 October 1869 – 30 January 1948) was the pre- eminent leader of Indian nationalism in British-ruled India. Employing nonviolent civil disobedience, Gandhi led India to independence and inspired movements for civil rights and freedom across the world. The honorific Mahatma applied to him first in 1914 in South Africa, is now used worldwide. He is also called Bapu in India. Born and raised in a Hindu, merchant caste, family in coastal Gujarat, western India, and trained in law at the Inner Temple, London, Gandhi first employed nonviolent civil disobedience as an emigrant lawyer in South Africa, in the resident Indian community's struggle for civil rights. After his return to India in 1915, he set about organising peasants, farmers, and urban labourers to protest against excessive land-tax and discrimination. Assuming leadership of the Indian National Congress in 1921, Gandhi led nationwide campaigns for easing poverty, expanding women's rights, building religious and ethnic amity, ending untouchability, but above all for achieving Swaraj or self-rule. Gandhi attempted to practise nonviolence and truth in all situations, and advocated that others do the same. He lived modestly in a self-sufficient residential community and wore the traditional Indian dhoti and shawl, woven with yarn hand spun on a charkha. He ate simple vegetarian food, and also undertook long fasts as means of both self-purification and social protest. Gandhi famously led Indians in challenging the British-imposed salt tax with the 400 km Dandi Salt March in 1930, and later in calling for the British to Quit India in 1942. He was imprisoned for many years, upon many occasions, in both South Africa and India. Gandhi's vision of a free India based on religious pluralism,was challenged in the early 1940s by a new Muslim nationalism which was demanding a separate Muslim homeland carved out of India. Eventually, in August 1947, Britain granted independence, but the British Indian Empire was partitioned into two dominions, a Hindu-majority Indiaand Muslim Pakistan. As many displaced Hindus, Muslims, and Sikhs made their way to their new lands, religious violence broke out, especially in the Punjab and Bengal. Eschewing the official celebration of independence in Delhi, Gandhi visited the affected areas, attempting to provide support. In the months following, he undertook several fasts unto death to promote religious harmony. The last of these, undertaken on 12 January 1948 at age 78, also had the indirect goal of pressuring India to pay out some cash assets owed to Pakistan. Some Indians thought Gandhi was too helpful. Among them was Nathuram Godse, a Hindu nationalist, who assassinated Gandhi on 30 January 1948 by firing three bullets into his chest at point-blank range. 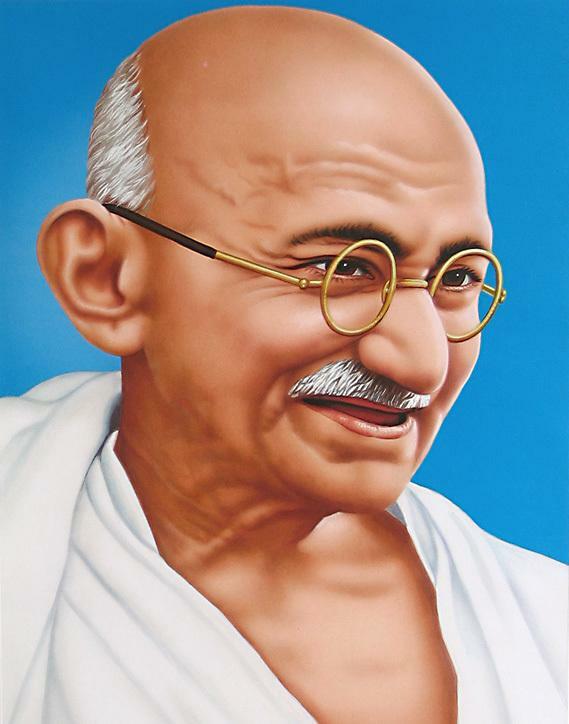 Gandhi is commonly considered the Father of the Nation in India. His birthday, 2 October, is celebrated in India as Gandhi Jayanti, a national holiday, and world-wide as the International Day of Nonviolence. Gandhi was born Mohandas Karamchand Gandhi, or "Mohan", on 2 October 1869 to Karamchand Gandhi and his wife Putlibai in a many-roomed, three-story house in Porbandar which is the present day Kirti Mandir – a temple of peace. Gandhi’s birthplace is in Kathiawar Peninsula, a region today part of Gujarat state in India, but then within the Bombay Presidency of British India. Described by Gandhi as "a lover of his clan, truthful, brave and generous", his father was the Diwan (chief minister) of Porbandar at the time of Gandhi’s birth, but later became the Diwan of Rajkot in 1876. Gandhi's grandfather Uttamchand Gandhi was also the Diwan of Porbandar. His mother, Putlibai, who was from a Pranami Vaishnava family, was Karamchand's fourth wife, the first three wives having apparently died in childbirth. The Indian classics, especially the stories of Shravana and king Harishchandra, had a great impact on Gandhi in his childhood. In his autobiography, he admits that they left an indelible impression on his mind. In May 1883, the 13-year-old Mohandas was married to 14-year-old Kasturbai Makhanji in an arranged child marriage, according to the custom of the region. In the process, he lost a year at school. In 1885, when Gandhi was 15, the couple's first child was born, but survived only a few days. Gandhi's father, Karamchand Gandhi, had also died earlier that year.Mohandas and Kasturba had four more children, all sons: Harilal, born in 1888; Manilal, born in 1892; Ramdas, born in 1897; and Devdas, born in 1900. At his middle school in Porbandar and high school in Rajkot, Gandhi remained a mediocre student. He shone neither in the classroom nor on the playing field. One of the terminal reports rated him as "good at English, fair in Arithmetic and weak in Geography; conduct very good, bad handwriting." He passed the matriculation exam at Samaldas College in Bhavnagar, Gujarat, with some difficulty. Gandhi's family wanted him to be a barrister, as it would increase the prospects of succeeding to his father's post. In 1888, Gandhi travelled to London, England, to study law at University College London, where he studied Indian law and jurisprudence and trained as a barrister at the Inner Temple. His time in London was influenced by a vow he had made to his mother upon leaving India, in the presence of a Jain monk, to observe the principles of abstinence from meat and alcohol as well as of promiscuity. Gandhi tried to adopt "English" customs, including taking dancing lessons. However, he could not appreciate the bland vegetarian food offered by his landlady and was frequently hungry until he found one of London's few vegetarian restaurants. Gandhi was called to the bar in June 1891 and then left London for India, where he learned that his mother had died while he was in London and that his family had kept the news from him. His attempts at establishing a law practice in Bombay failed because he was too shy to speak up in court. He returned to Rajkot to make a modest living drafting petitions for litigants, but he was forced to close it when he ran foul of a British officer. In 1893, he accepted a year-long contract from Dada Abdulla & Co., an Indian firm, to a post in the Colony of Natal, South Africa, then part of the British Empire. Gandhi was 24 when he arrived in South Africa to work as a legal representative for the Muslim Indian Traders based in the city of Pretoria. He spent 21 years in South Africa, where he developed his political views, ethics and political leadership skills. Guha argues that when he returned to India in 1914 he was proficient at public speaking, fund-raising, negotiations, media relations, and self-promotion. Indians in South Africa were led by wealthy Muslims, who employed Gandhi as a lawyer, and by deprived Hindu indentured labourers with very limited rights. Gandhi extended his original period of stay in South Africa to assist Indians in opposing a bill to deny them the right to vote. Gandhi's ideas took shape, and the concept of Satyagraha matured during this struggle. Gandhi focused his attention on Indians while in South Africa and opposed the idea that Indians should be treated at the same level as native Africans while in South Africa.He also stated that he believed "that the white race of South Africa should be the predominating race." After several treatments he received from Whites in South Africa, Gandhi began to change his thinking and apparently increased his interest in politics. During the Boer war Gandhi volunteered in 1900 to form a group of ambulance drivers. He wanted to disprove the British idea that Hindus were not fit for "manly" activities involving danger and exertion. Gandhi raised eleven hundred Indian volunteers. They were trained and medically certified to serve on the front lines. In 1906, when the British declared war against the Zulu Kingdom in Natal, Gandhi encouraged the British to recruit Indians. He argued that Indians should support the war efforts to legitimize their claims to full citizenship. The British accepted Gandhi's offer to let a detachment of 20 Indians volunteer as a stretcher-bearer corps to treat wounded British soldiers. Gandhi took leadership of Congress in 1920 and began a steady growth of demands until on 26 January 1930 the Indian National Congress declared the independence of India. The British did not recognize that and more negotiations followed, with Congress taking a role in provincial government in the late 1930s. Gandhi and Congress withdrew their support of the Raj when the Viceroy declared war on Germany in September 1939 without consulting anyone. Tensions escalated until Gandhi demanded immediate independence in 1942 and the British responded by imprisoning him and tens of thousands of Congress leaders for the duration. Meanwhile the Muslim League did cooperate with Britain and moved, against Gandhi's strong opposition, to demands for a totally separate Muslim state of Pakistan. In August 1947 the British partitioned the land, with India and Pakistan each achieving independence on terms that Gandhi disapproved. Congress in the 1920s appealed to peasants by portraying Gandhi as a sort of messiah, a strategy that succeeded in incorporating radical forces within the peasantry into the nonviolent resistance movement. In thousands of villages plays were performed that presented Gandhi as the re-embodiment of earlier Indian nationalist leaders, or even as a demigod. The plays built support among illiterate peasants steeped in traditional Hindu culture. Similar messianic imagery appeared in popular songs and poems, and in Congress-sponsored religious pageants and celebrations. The result was that Gandhi became not only a folk hero but the Congress was widely seen in the villages as his sacred instrument.